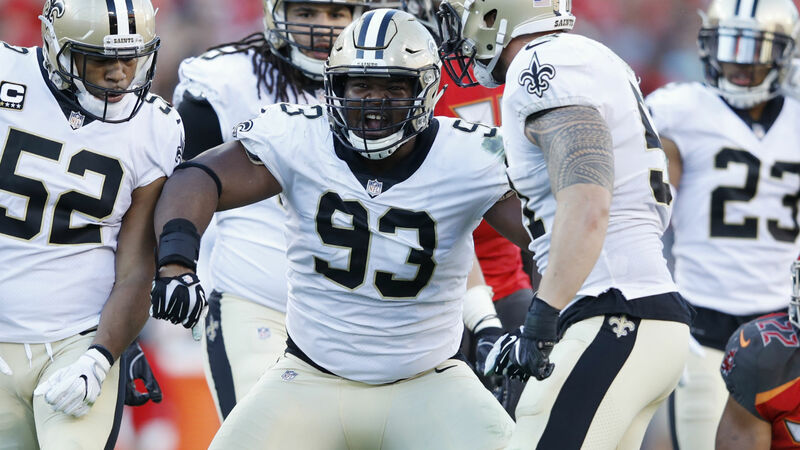 Saints defensive tackle David Onyemata picked up a fine larger than his weekly game check after two roughing-the-passer penalties were called on him against the Buccaneers last week, an ESPN report stated. Onyemata will be pegged with a $40,108 fine, an amount actually surpassing his game salary of $37,059. But he may not be stuck with the full ticket. Players can appeal to have their fine reduced if it exceeds 50 percent of their salary, according to the NFL’s collective bargaining agreement. They can also appeal if a fine for one offense exceeds 25 percent of their weekly check or a fine for two offenses exceeds 50 percent. This would bring Onyemata’s total down to $9,264. Any player who’s fine accounts for more than 25% of their weekly pay can appeal to have their final cost reduced to 25% of their weekly pay. Re: David Onyemata scored 2 separate $20,054 infractions, w/ a weekly pay of $37,058. He can ask for appeals down to $9,264. Onyemata, a fourth-round pick in the 2016 draft, wasn’t the only one pegged with a hefty fine in the NFL’s opening weekend, but he was the only player to be hit with two. One of the penalties fell under the umbrella of the new roughing-the-passer rule, which doesn’t allow defensive players to put their full body weight on the quarterback. Many players have expressed frustration with fines stemming from this change, but Onyemata is focused on ways of working around it.